Wicket and Craig American leather is known for its rich color and willingness to take oil. Our Dark Brown Leather collection is accented with champagne colored stitching, enhancing its overall beauty. 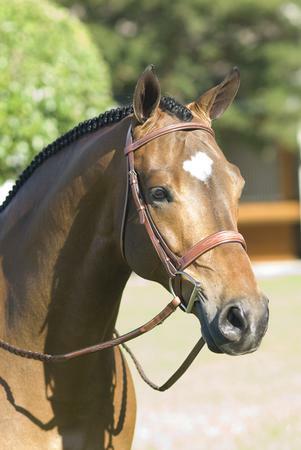 Padded fancy stitched bridle features Ovation's exclusive "Comfort Crown" design. With fancy stitched raised laced reins. Wicket and Craig American leather is known for its rich color and willingness to take oil. Our Dark Brown Leather collection is accented with champagne colored stitching, enhancing its overall beauty. 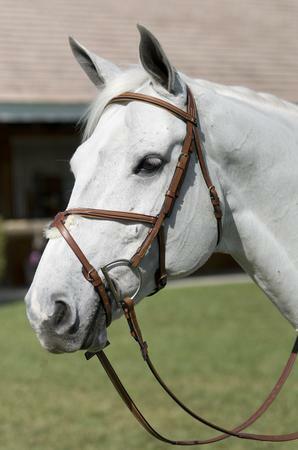 Padded fancy stitched bridle features Ovation's exclusive "Comfort Crown" design. With BioGrip™ Rubber reins. Specially designed to accommodate a narrower palate, the Ovation® Elite Bits feature a shorter rotated link, which allows it to rest entirely on the tongue when rein pressure is applied. This special positioning allows for more precise communication through the reins. , 14mm mouth with 55mm rings. 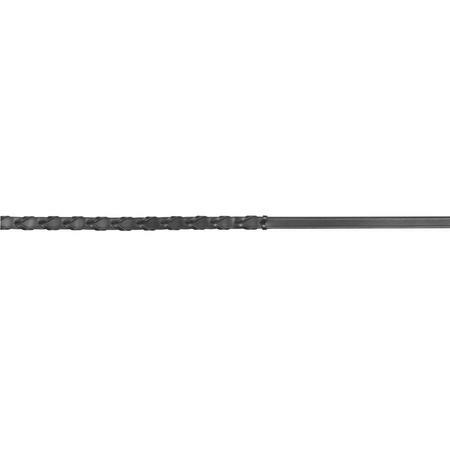 Specially designed to accommodate a narrower palate, the Ovation® Elite Bits feature a shorter rotated link, which allows it to rest entirely on the tongue when rein pressure is applied. This special positioning allows for more precise communication through the reins. , 14mm mouth with 75mm rings. Specially designed to accommodate a narrower palate, the Ovation® Elite Bits feature a shorter rotated link, which allows it to rest entirely on the tongue when rein pressure is applied. This special positioning allows for more precise communication through the reins. , 18mm mouth. Specially designed to accommodate a narrower palate, the Ovation® Elite Bits feature a shorter rotated link, which allows it to rest entirely on the tongue when rein pressure is applied. This special positioning allows for more precise communication through the reins. , 16mm mouth. 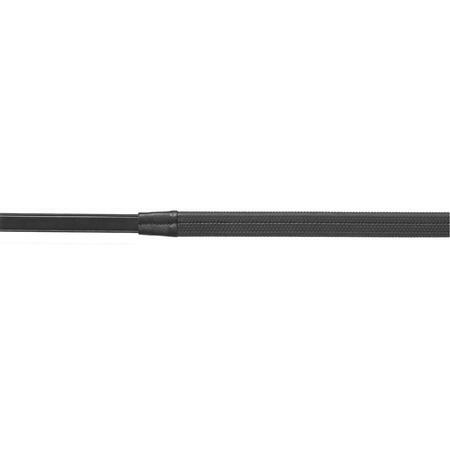 Specially designed to accommodate a narrower palate, the Ovation® Elite Bits feature a shorter rotated link, which allows it to rest entirely on the tongue when rein pressure is applied. 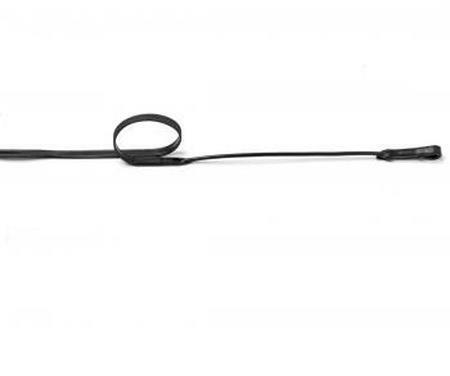 This special positioning allows for more precise communication through the reins. , 15mm mouth with 86mm rings. Specially designed to accommodate a narrower palate, the Ovation® Elite Bits feature a shorter rotated link, which allows it to rest entirely on the tongue when rein pressure is applied. This special positioning allows for more precise communication through the reins. 16mm mouth with 70mm rings. Specially designed to accommodate a narrower palate, the Ovation® Elite Bits feature a shorter rotated link, which allows it to rest entirely on the tongue when rein pressure is applied. 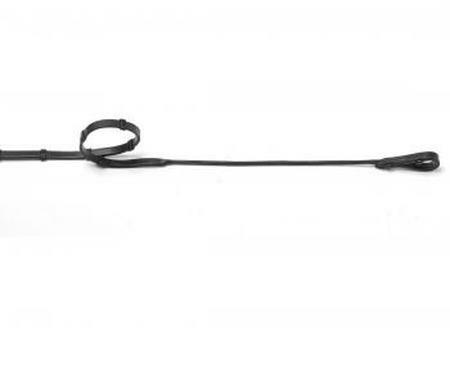 This special positioning allows for more precise communication through the reins. , 18mm mouth with 70mm rings. 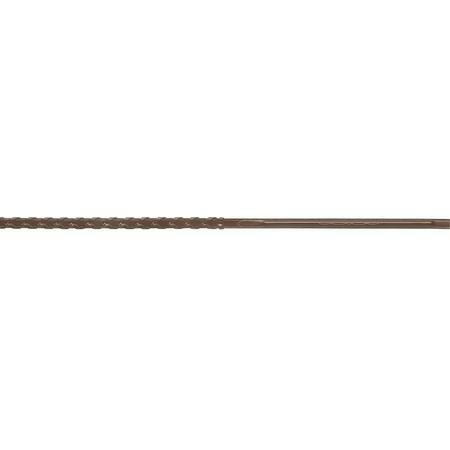 Contoured padded Comfort Crown, curved browband designed to lay flat against the head and inlaid with clear crystals, wide leather crank cavesson, 5/8" rubber lined leather reins, and 1/2" flat curb reins. Designed in Germany and built from the finest leathers in our own workrooms, the Europa™ collection allows us to bring the prices for authentic German styling and sizing down to earth. Riders asked, Ovation(R) delivered! Add some sparkle to your ride with the Fantasia Collection! 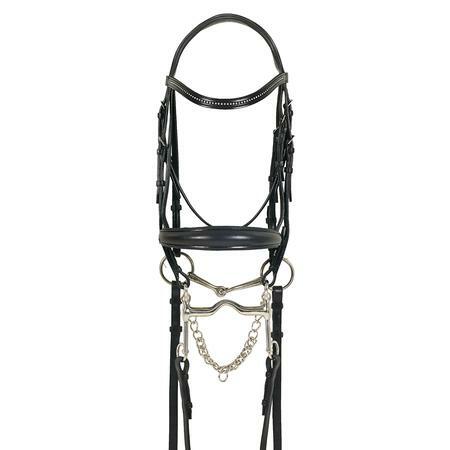 This bridle features a jeweled browband, with embossed noseband and reins, for the perfect amount of bling. With flash and web reins. 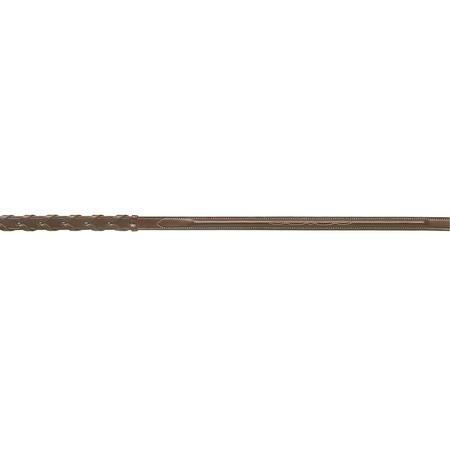 SKU 469746Our Price $139.95 $75.58 On Sale! The ultimate in comfort in this hand finished Italian leather features Ovation®'s exclusive "Comfort Crown". 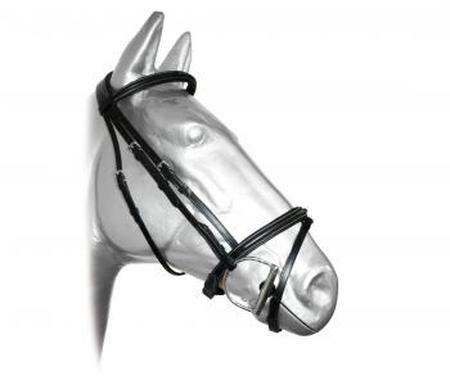 This snaffle bridle is padded and comes with a flash and 5/8" rubberized reins. Expertly crafted from England's finest leather. 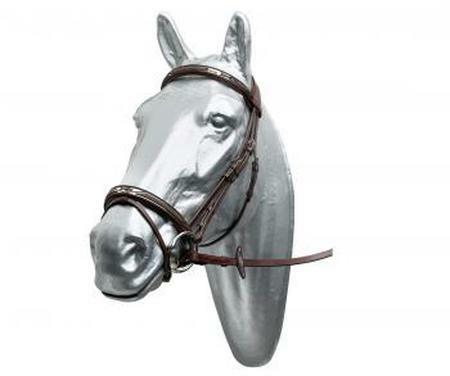 The Recessed Crown System is designed to alleviate unwanted pressure on the sensitive poll area of the horse. 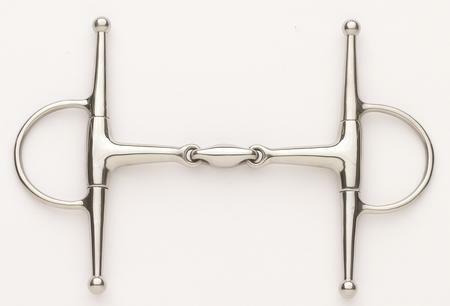 The RCS design allows the cavesson strap to pass over the crown in a recessed channel with only soft padding touching the horse. The RCS Fancy Stitched Padded Bridle is crafted in rich and supple Italian leather, and features fancy stitching on the cavesson and browband, and fancy stitched raised laced reins. 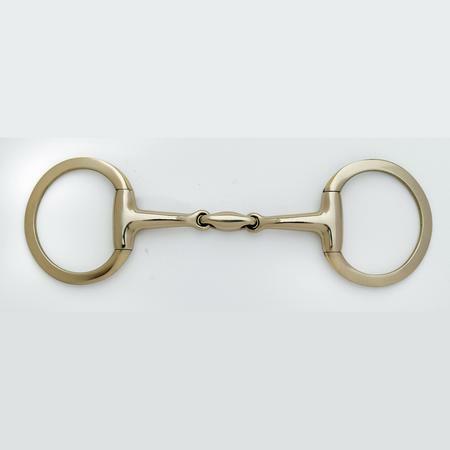 The Recessed Crown System is designed to alleviate unwanted pressure on the sensitive poll area of the horse. 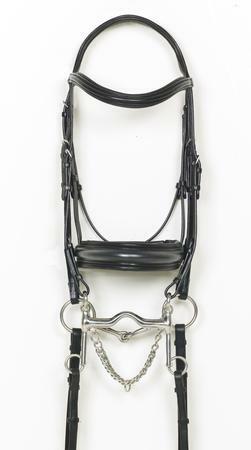 The RCS design allows the cavesson strap to pass over the crown in a recessed channel with only soft padding touching the horse. The RCS Jumper Bridle is crafted in rich and supple Italian leather, and features fancy stitching on the cavesson and browband, genuine sheepskin disk, and rubber reins. Buckle ends. 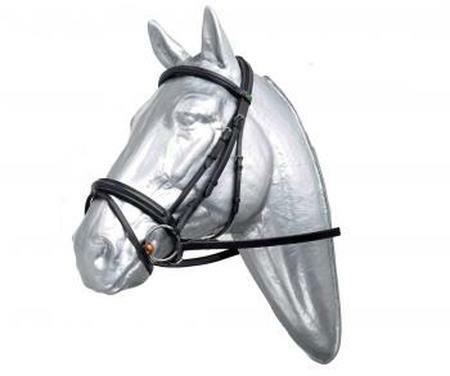 The Recessed Crown System is designed to alleviate unwanted pressure on the sensitive poll area of the horse. The RCS design allows the cavesson strap to pass over the crown in a recessed channel with only soft padding touching the horse. The RCS Wide Padded Nose Bridle is crafted in rich and supple Italian leather, and features fancy stitching on the wide-nose cavesson and browband, and fancy stitched raised laced reins. Rubber covered reins. 5/8" crafted in Italian leather. 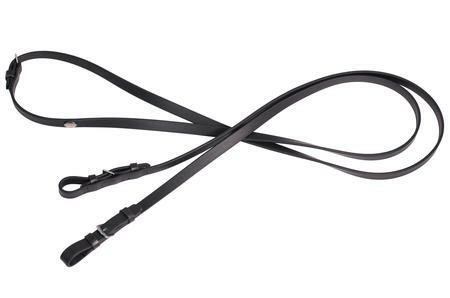 Rubber lined reins with rubber on the inside for added grip, in Italian hand finished leather with buckle ends. 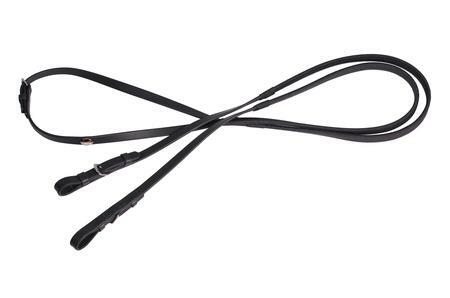 Our top quality English leather reins with rubber grips. Rubber grip reins with pimples in Ovation® 's finest English leather. 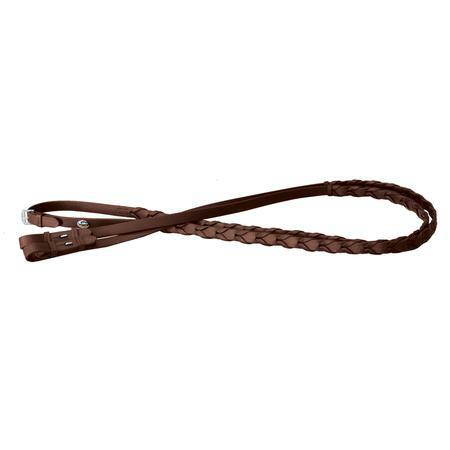 Our top quality English leather rubberized sure grip reins with buckle ends. Made of supple leather, in a monocrown design that provides cushioning and eliminates bulk. 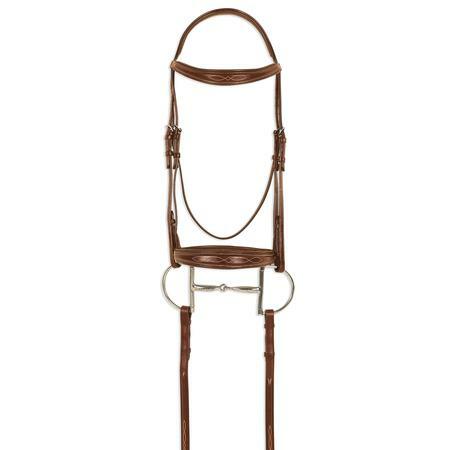 With crank noseband, rubber lined snaffle reins and leather curb reins. Elastic section provides a slight bit of give to reduce sharp jerks on the bit. Ultra grippy synthetic glove with strategically placed stretch inserts for comfort and feel on the reins, plus a fun pop of color. 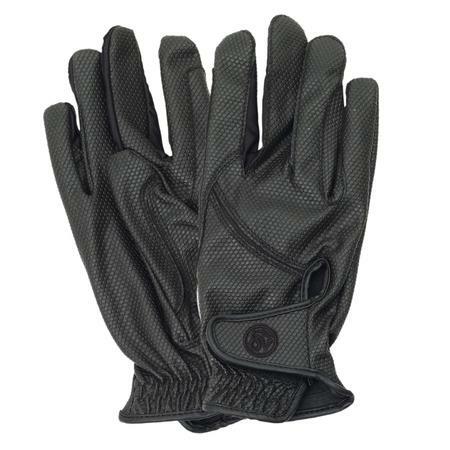 Features Smarttap touch screen technology and hook and loop wrist closure. Ultra grippy synthetic glove with strategically placed stretch inserts for comfort and feel on the reins, plus a fun pop of color. With SmartTap™ touch screen technology. The Viviana Bridle features the Comfort Crown System, raised V-Browband with crystals, round raised cutback nose and 5/8" anti-slip reins. Designed with the US style fit. 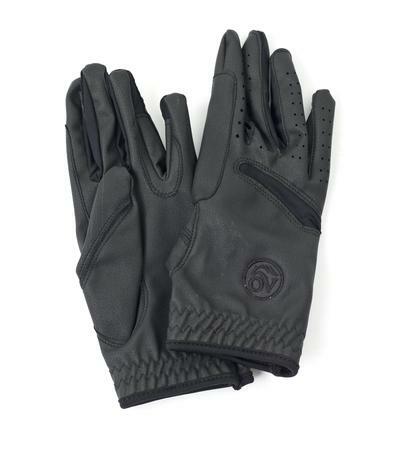 Made of quality prefinished leather that is soft, supple and ready to use. No oil required, simply wipe clean after use and condition as needed. 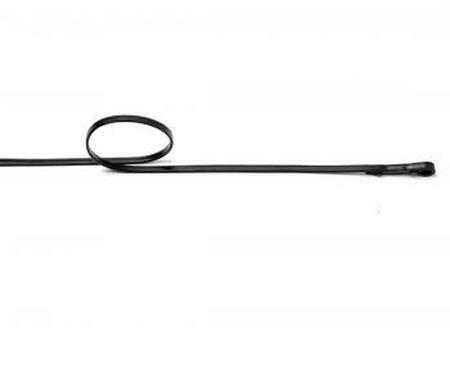 With plain raised Biothane® lined rubber covered reins with sewn on leather stops. 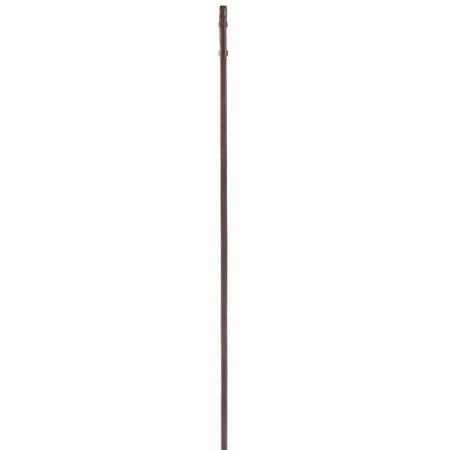 SKU 467043Our Price $420.00 $226.80 On Sale! 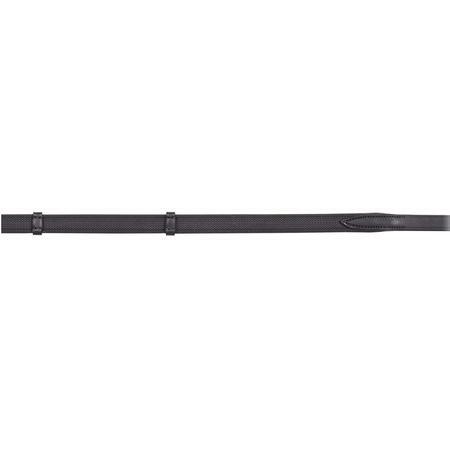 The Prestige A10 Special Girth is very similar to the larger A7 Stud Guard girth, but does not offer the protection of a stud guard girth. Instead, the A10's purpose to increase the load bearing area under the belly which results in more comfort for the horse and more stability in the saddle. 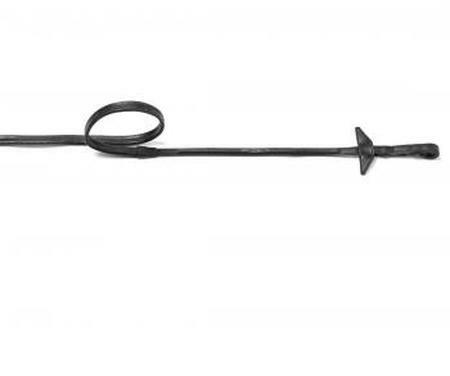 The A10 Special Girth also offers a carabiner in the middle of the girth for easy attachment of loop end martingales as well as three dee hooks for snap end martingales, draw reins and other training aids. 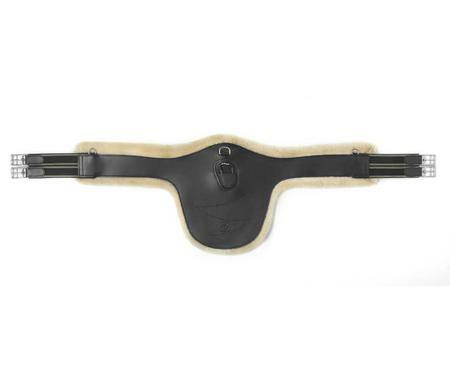 SG SAFETY GIRTH WITH STUD GUARD Patented saddle girth with stud guard specifically designed to prevent accidents caused when the front leg of the jumping horse gets tangled in the draw reins or in the martingale. When the horse positions itself to clear an obstacle, its front legs and shoes come in close proximity to the martingales or other aids. Should they become ensnared, a potentially serious fall is inevitable. This equipment is your best protection against such accidents. 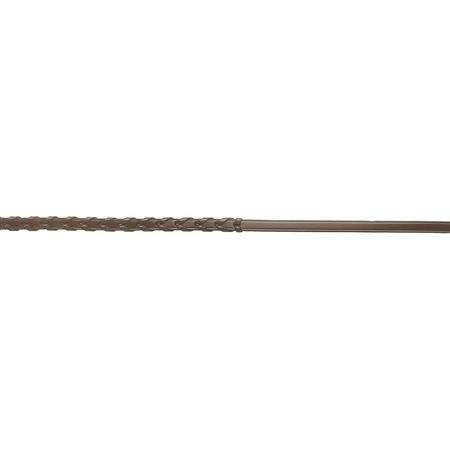 The A9 is a long elasticated girth designed to be used with jumping saddles with short billets. 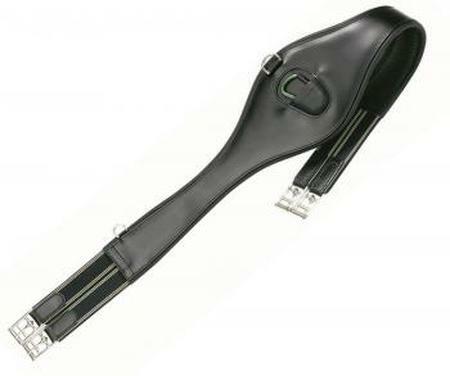 It is shaped to increase the load bearing area across the belly, and is made from smooth padded leather. 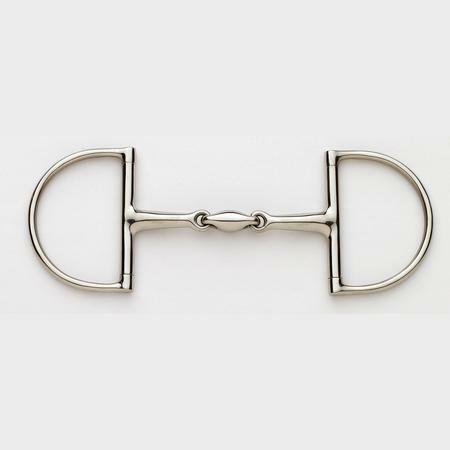 It features D rings on the sides for attaching draw reins and a D ring and clip in the middle for attaching martingales with either a clip or loop. 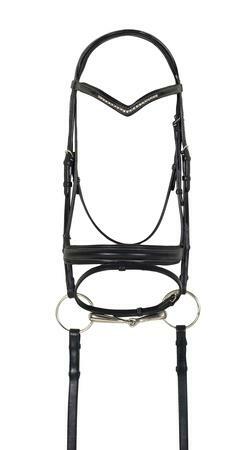 The snaffle bridle High-Line is made entirely in leather and stands out for the new inserts used in the browband and noseband. Made in composite material and steel. 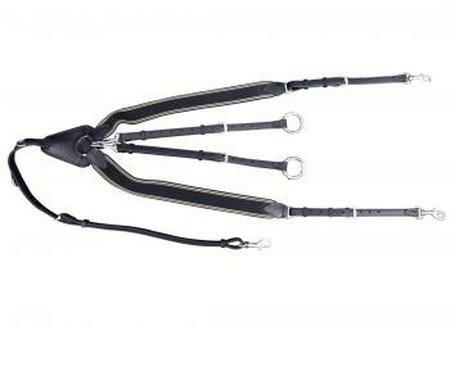 With combined noseband with flash and stainless steel buckles. 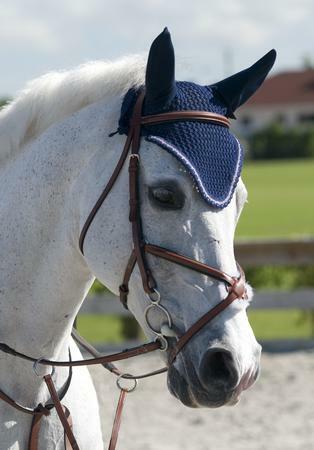 Very soft padded at the anatomically formed headpiece and at the brow- and noseband. 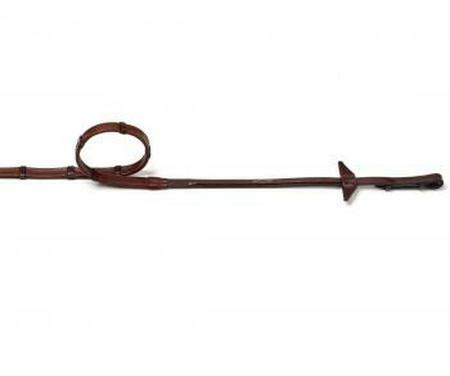 The snaffle bridle comes without reins. E133A Fancy Stitching ultra-slim rubber reins with stoppers Ultra-slim rubber reins with 7 stoppers. They have a ridge profile and intricate decorative stitching. Diameter 22mm. 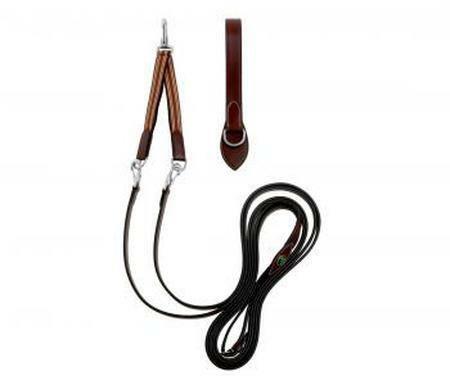 Colors: black reins with white and turquoise stitching, and tobacco brown reins with white and red stitching. 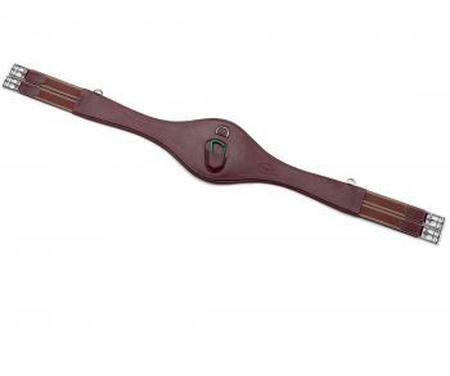 E136 Slim leather reins for dressage Leather reins for dressage. 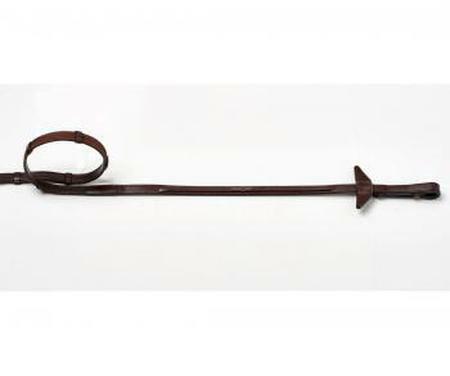 E137 Leather reins for dressage with stoppers Leather reins with 7 stoppers: workmanship is intricate. Cotton reins for the Prestige E38 Bridle. Evo Running Martingale Attachment This is the martingale attachment that we have all been waiting for. 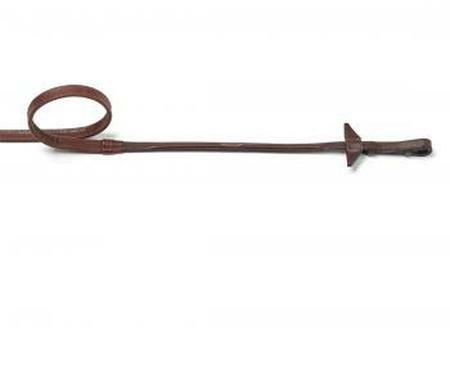 The days of unbuckling your reins to thread them through this running martingale are gone! Simple snap rings make for easy threading without any hassle. Highly adjustable to fit many different horses. 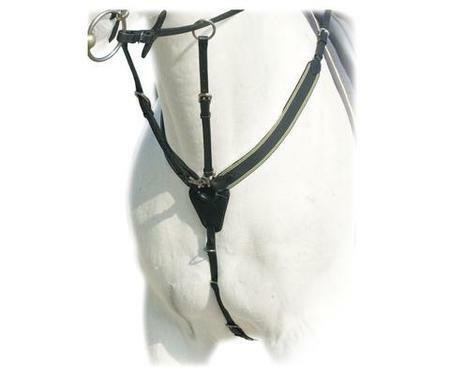 Attaches to breast collar with simple clips for a quick, easy, running martingale. Made to the top standards of all Prestige products with high quality leather and durable chrome hardware. 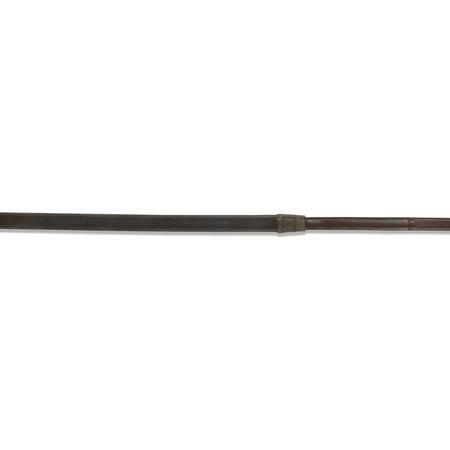 The A8 is a long elasticated girth designed to be used with jumping saddles with short billets. It is shaped to reduce the damage to the horses belly caused by shoes and studs, and is made from smooth padded leather. 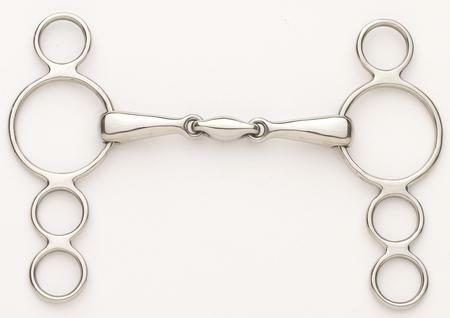 It features D rings on the sides for attaching draw reins and a D ring and clip in the middle for attaching martingales with either a clip or loop. Available in black or tobacco. 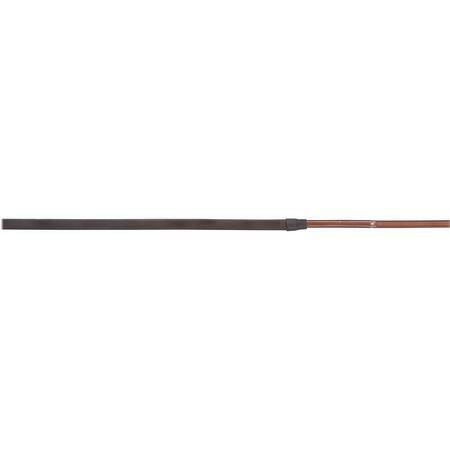 The Prestige NEW X-BREATH LINE A10 Special Girth is very similar to the larger A7 Stud Guard girth, but does not offer the protection of a stud guard girth. 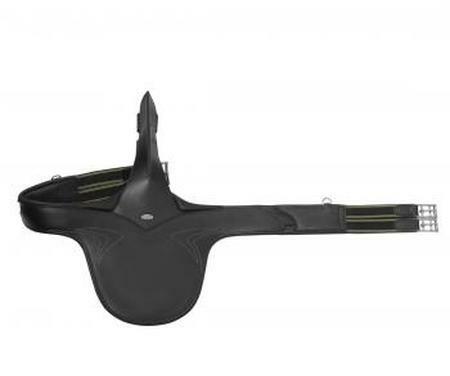 Instead, the A10's purpose to increase the load bearing area under the belly which results in more comfort for the horse and more stability in the saddle. 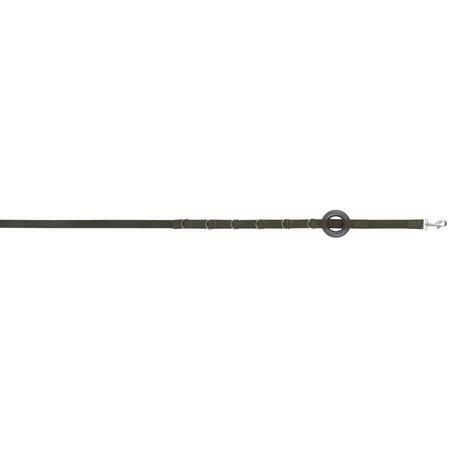 The A10 Special Girth also offers a carabiner in the middle of the girth for easy attachment of loop end martingales as well as three dee hooks for snap end martingales, draw reins and other training aids. 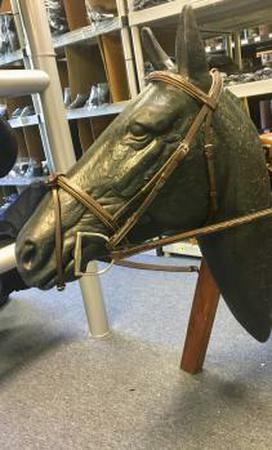 A triple raised bridle made from soft Italian leather. Very popular style on the competition circuit. 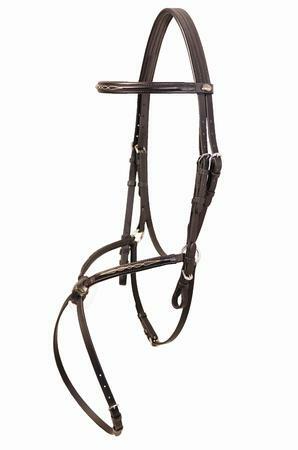 Features a padded comfort headpiece and padded browband and noseband. Choice of rubber or continental web reins are included. With genuine sheepskin disk. Competition quality in hand finished leather with impeccable details and performance. 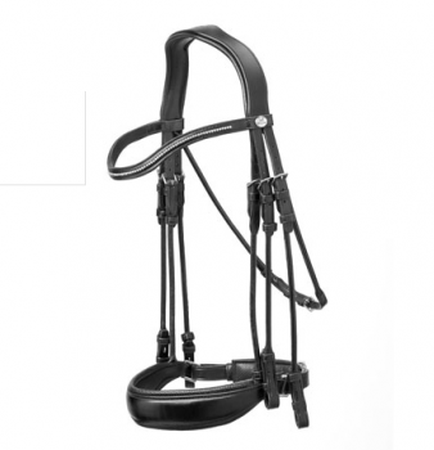 This deluxe Italian made Bridle’s offer all the luxury one would expect from Prestige Italia! Amazing leather, very finally detailed stitching: A once-in-a-lifetime sale event! 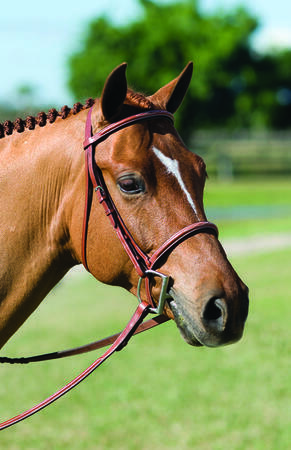 The browband and nosebands are raised with fancy detailing; see the attached pictures. 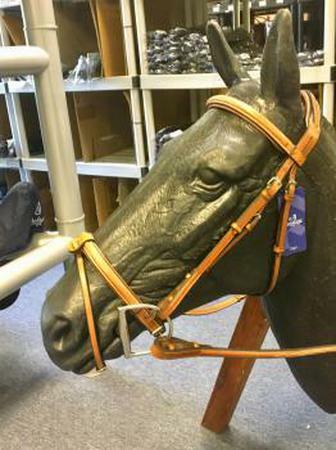 Remember Prestige Italia bridles fit a little generous. 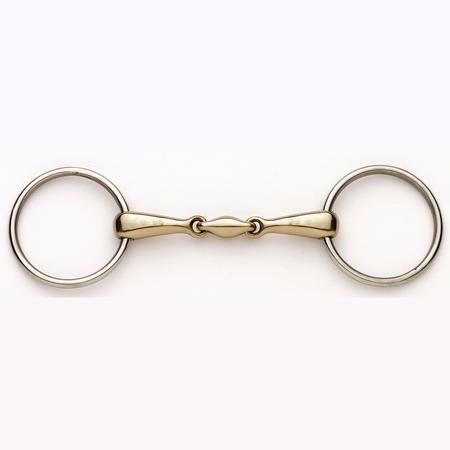 The cob size will fit cobs, Arabian and most thoroughbred horses 16 hands and under. 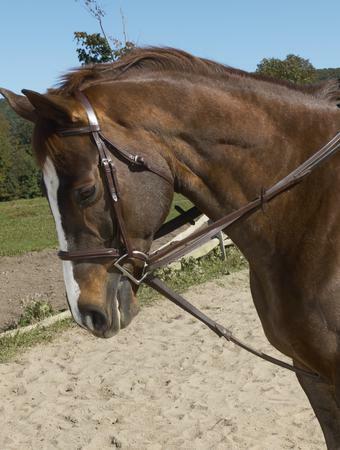 The horse size will fit most medium size and warmblood horses. 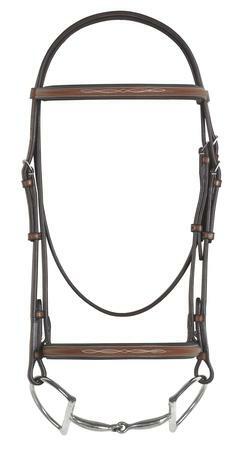 The matching standing martingales are in the same wonderful Italian leather with the same fine craftsmanship. SKU 43839Our Price $420.00 $210.00 On Sale! SKU 43838Our Price $420.00 $210.00 On Sale! 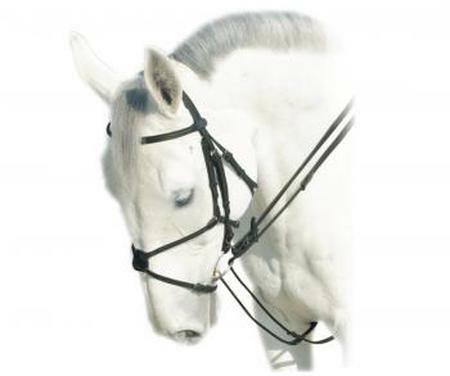 These deluxe Italian made Bridle’s offer all the luxury one would expect from Prestige Italia! SKU 43837Our Price $420.00 $210.00 On Sale! A great new side rein concept that makes adjustment very quick. 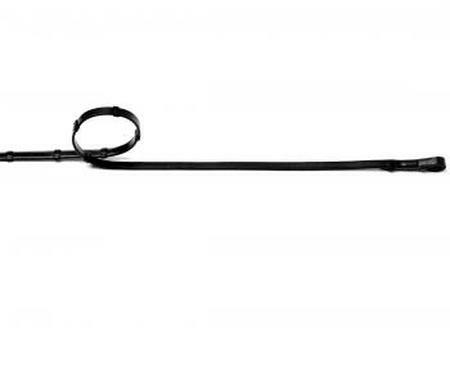 Designed to work with the Dry-Tex Equalizer girth, or any lunging surcingle. Grippy in all conditions while staying pliable, these anti-slip reins feature stainless steel hardware with buckle ends. 1/2". Made of QUIK-CLEAN material. Grippy in all conditions while staying pliable, these anti-slip reins feature stainless steel hardware with snap ends for quick and easy bit changes. 1/2". Made of QUIK-CLEAN material. 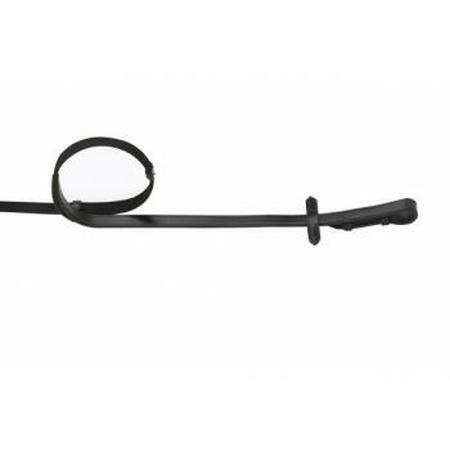 These flat reins are pliable without sacrificing feel. Features stainless steel hardware with buckle ends. 5/8". Made of QUIK-CLEAN material. 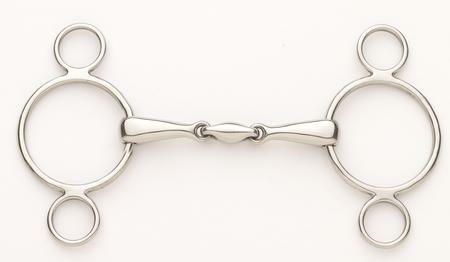 Soft and pliable, these laced reins feature stainless steel hookstuds for a traditional hunter look. 5/8". Made of QUIK-CLEAN material. 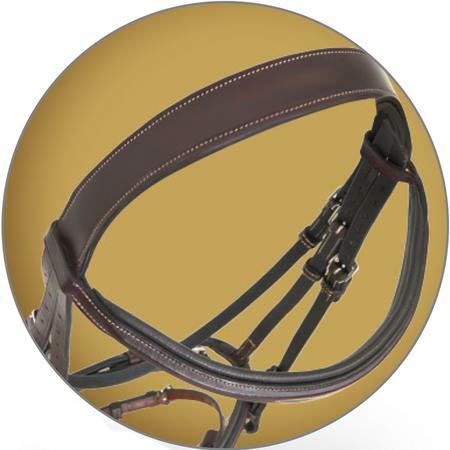 This Tekna® Padded Dressage Bridle features a softly padded brown and nose, with a removable flash and buckle cheekpieces. Made of QUIK-CLEAN material. Less reins.